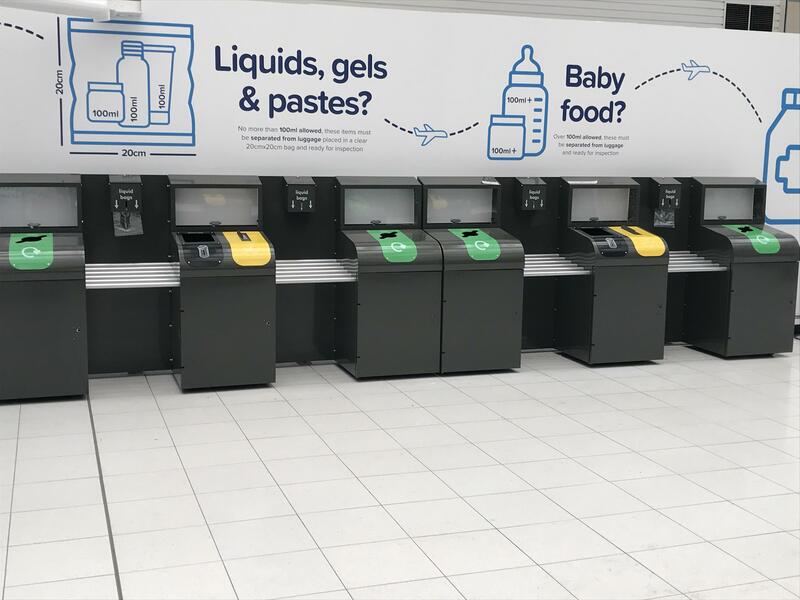 We’re pleased to have worked with Birmingham International Airport again to provide them with bespoke units to encourage recycling in their passenger security and liquid preparation areas. We have previously worked with the airport to provide a number of special units to promote recycling within the terminals, so when they approached us to create large, secure units, we were happy to help. The requirements of the project were to help with the new North Terminal Security Extension project, through the installation of multiple stations in the upgraded departures area. Waste managers at the airport identified that passengers were reaching the divestment area unprepared, and this led to delays in the process of luggage being checked and passed through security. Items which could have been identified at an earlier stage could have been removed before the passenger reached the scanner areas and would have led to less rejected trays and delays for other passengers. The airport concluded that their liquid preparation area was not adequate for the volume of passengers that were departing from the terminal. It was important for the area to provide passengers with visual information to help them prepare for passing through security, at the earliest possible point in their travel journey. The unit would need to be suitable for collecting unacceptable items and also to act as a designated area to make people aware of security requirements, such as the removal of certain outer clothing; belts, shoes etc. and electronic items. The waste streams would need to collect recycling, liquids, general waste and sharps. It also needed to contain a dispenser for clear plastic bags and a transparent cabinet to display examples of accepted and restricted items. We designed a three-bin unit that incorporated two sets of racks for cases and bags to be placed whilst passengers remove restricted items. We worked closely with the team at Birmingham International Airport to incorporate all of their needs into one large deposit unit. Based around our Lute Recycling Bin design, these units were powder coated in grey, to the Airport’s specification and built in a modular style design to make them easy to move and fit together. The units are built with sloping lids to prevent any items being left on top and the apertures feature galvanised steel fascia plates to direct the correct items into the bin. Rear locked access is provided at the back of the units for the Perspex windows, giving an area for the airport to place examples of acceptable and restricted items such as bottled water and razor blades. The bins are secured with slam locks to the front to allow for easy emptying and each one features a plastic leak-proof tray to stop any liquid spillages. Castors are fitted to the base of the units so that they can be easily moved when necessary and they are also fitted to the internal liners to aid emptying of the bins. In total, 14 of these large units are being implemented in the terminal. Due to the large scale design of these units, they are being built at the point of installation as part of the service from Wybone. Our skilled technicians are siting the units on behalf of the airport so that they are placed straight into position and fixed together. This is not our first project working with the airport. We previously worked directly with Service Delivery Contracts Manager, Deane Arnold, to implement our Torpedo Triple Recycling bins, our purpose built 120 litre airport bins and our four compartment Console units, which are used to collect aerosols, gels and creams, perfumes and sharps. If you have any specific collection and security requirements, feel free to contact us on 01226 352323 or email hello@wybone.co.uk and we’ll be happy to provide you with a quotation or sample.